Snow, flooding and powerful tornadoes have ripped through many central US states, emergency officials said. The most affected were Texas and South Dakota where dozens of people have been injured and many houses were left in ruins. The storm hit eastern Van Zandt County and the town of Van in northeast Texas on Sunday, the Van Zandt County fire marshal and emergency management coordinator Chuck Allen said. At least 26 people have been taken to hospital with injuries. About 30 percent of Van, a town with 2,500 people, was damaged. "Damages range from completely destroyed homes, damaged homes, to trees and power lines down," Allen said, adding that utility companies are now restoring "vital infrastructures." Also the American Red Cross is to open a shelter at First Baptist Church in Van, Allen said. At least six people have been pulled out of homes by rescue helicopters in Denton County thunderstorms brought heavy rains in the area, officials said. The storms have been affecting Texas for almost a week now. On Saturday, one person was killed in a tornado. Powerful storms have also hit South Dakota where at least nine people received non-threatening injuries. A local Lutheran Church and 20 more buildings have been destroyed. "Our house is flat. There is nothing left," Stephanie Lunder Delmont told AP. The officials have been evacuating the residents of Delmont, a town of 234 people. "It's a voluntary evacuation: there's no water, no heat, no electricity," Tony Mangan, public information officer for the South Dakota Department of Public Safety, told Reuters. David Mathews, 70, who owns Old Bank Mini-Mart in Delmont, said that the storm was very fast. The Black Hills, a small, isolated mountain range, in South Dakota has seen 30cm of snow. Tornadoes hit central Iowa where a roof from a high school was ripped off. 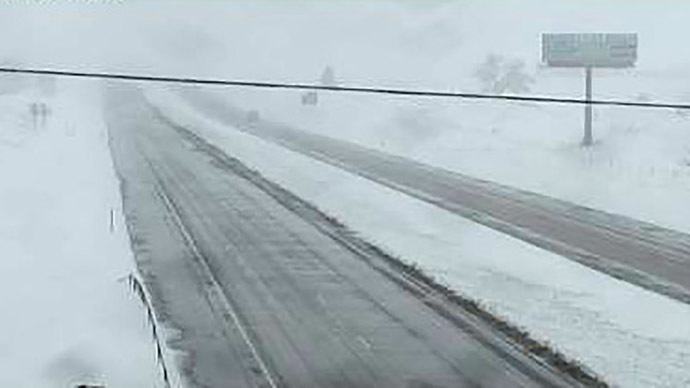 Snow fell in parts of the Rocky Mountains and western Nebraska. A tropical storm has struck the southeastern US as it created wet and windy conditions in North and South Carolina.